The new tread for baby gender reveal parties is colored lasagna. Now I love lasagna as much as the next carb lover, but to use the tasty dish to reveal the gender of you future child, not a fan! Blue or pink balloons out of a box, makes sense. Pink or blue inside of a cake, perfect. If you can afford, blue or pinkish fireworks, love it. But lasagna?! Don’t invite me for dinner ever again. 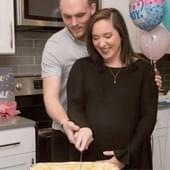 Check out the video of this couple revealing their future babies gender with lasagna below.